On paper, the hosts should be able to take control of this game on Friday night but it hasn’t been plain sailing for the Greek side so far this season. Olympiacos Piraeus have a 6-4 record going into this game while the side from Kazan carry a 3-7 record. This is the first time these two sides have met so there will be a little bit of history in the Euroleague this week and with both teams winning their last game, confidence should be high in this clash. One thing that you expect from Olympiacos is that they will set their stall out with two veteran players up top. Vassilis Spanoulis is still in fantastic form and with an average of 15.2 points per game so far this season, he is currently ranked as the seventh best scorer in the league. Alongside Spanoulis you’ll find Georgios Printezis who has provided an average of 12 points per game this season. These two have been at the heart of the success achieved by Olympiacos so far this season but their defence has also been decent enough, limiting opponents to an average of 77 points per game. 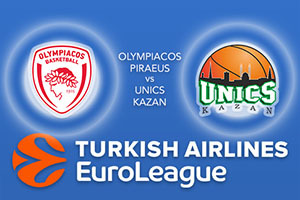 Unics Kazan can boast of the top scorer in the Euroleague, so the Olympiacos defence may be tested in this game. Keith Langford has managed an average of 23.2 points per game so far this season, and he has notched a minimum of 22 points on eight of the ten games played by Kazan so far this season. He isn’t the only player making a difference though as Artsiom Parakhouski has notched an average of 12.2 points per game, and an average of 6.2 rebounds so far this season. There was also a big showing last week from Vadim Panin, who grabbed a career high of 18 points. Unics grabbed a big win on the road earlier this season against Fenerbahce and they’ll believe they can win in Greece this week. Olympiacos should have enough to clinch this game but take Unics Kazan at +8, which is available at odds of 1.90. For the Over/Under market, go UNDER 155.5 which is provided at odds of 1.90. Bet Now!